NEW DELHI- Students at Sri Aurobindo Centre for the arts spend time absorbing each others family albums from c1990s. 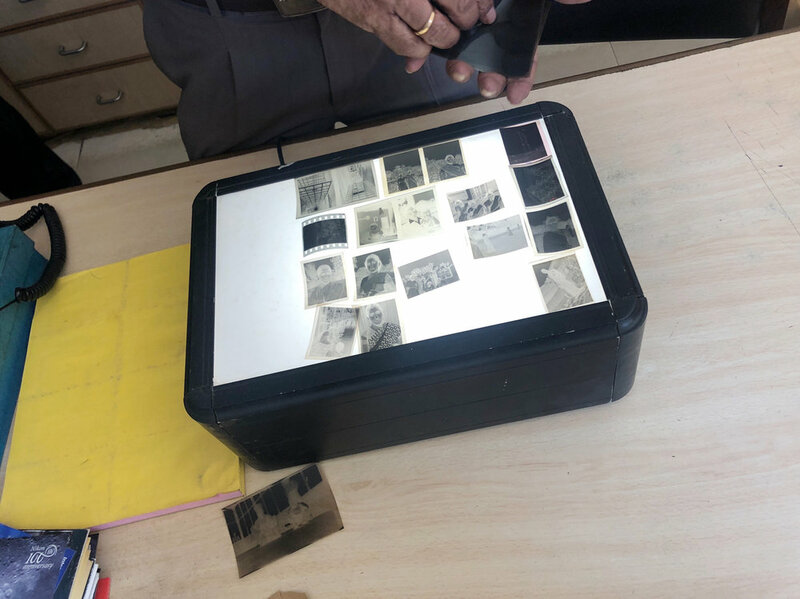 Anand Chhabra conducted a workshop and presentation session about the archive with the first year students who come from all over India for over 3 and half hours. NEW DELHI- With first year students at Sri Aurobindo centre with first year students. Students come from all over India to study here in groups to discuss the similarities and differences of AH archive and their own family albums. 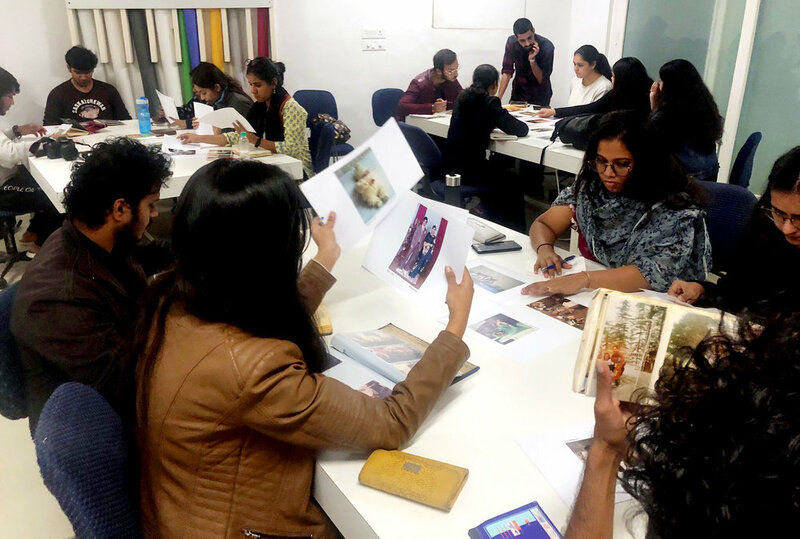 NEW DELHI - The students brought sa good number of their own family albums to the workshops and it proved to be an ‘at last !’ moment for me because finding groups to work researching family albums was the only very elusive part of my planned trip.. This is because like anywhere else everybody’s on the mobile phones all the time with not a great deal of value placed on the family album! PUNJAB, AMRITSAR - Two rising stars Hardeep and Sandeep with holding one of the 10x8 glass plates contained within handmade boxes they have collected over 6 years in with a focus in Sikh History in Punjab. This had to be one of the main highlights of journey as its an incredible collection and professionally and lovingly archived. PUNJAB, AMRITSAR - An original 10x8 glass plate, one of over 1000 in Hardeep and Sandeep’s collection. PUNJAB, AMRITSAR - Wonderful to browse through emotive images of family from c1920s Punjab. Hardeep and Sandeep collected many many prints as well as glass plates! PUNJAB AMRITSAR - Presentation made on Punjabi migration at the Indian Academy of fine Arts in Amritsar. This was arranged by Diwan Manna from the Punjab Lalit Kala Akadmie, Chandigarh, Punjab. Special thanks to them. 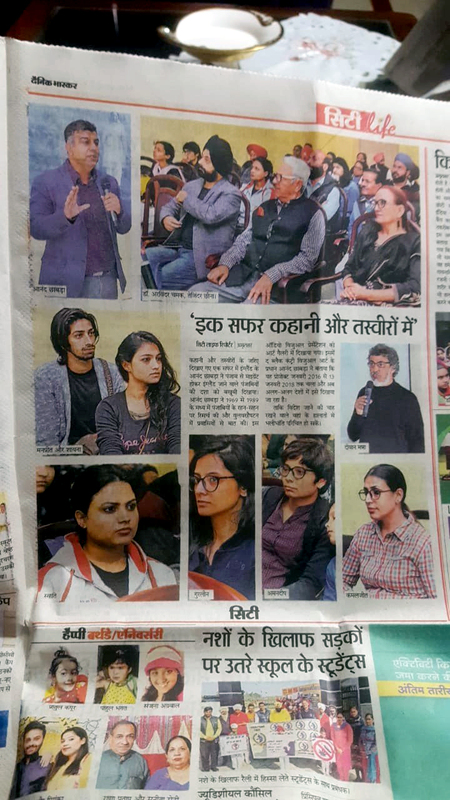 PUNJAB AMRITSAR - The presentation at the Indian Academy of Fine Arts reached the local media in Amritsar and in other parts of North India. CHANDIGARH, PUNJAB - The truly great, amazing and very talented Diwan Manna an internationally recognised artist in his own right and President of the Punjab Lalit Kala Akademi- Diwan opens preceding for and behalf of a presentation on Punjabi Migration to Wolverhampton at the Akademi. Anand and he have become fantastic friends. Picture background courtesy of the DASS family Inkerman Street, Wolverhampton c1961. 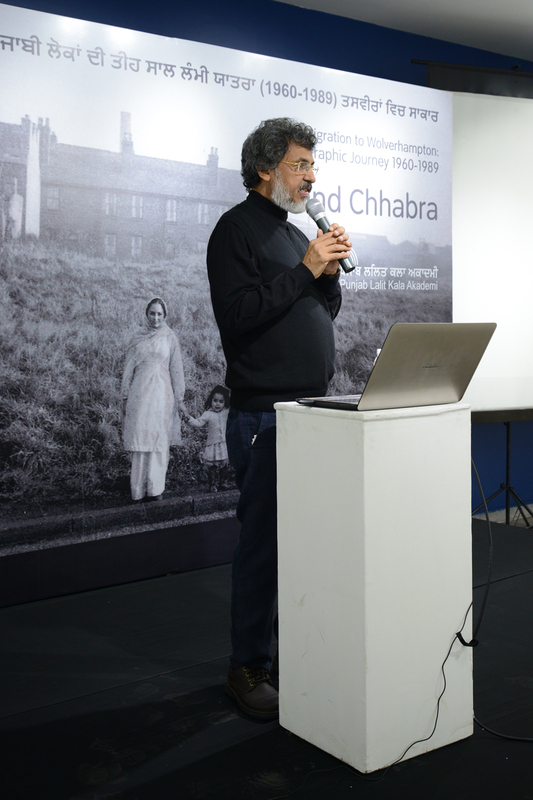 CHANDIGARH, PUNJAB - Anand Chhabra begins the presentation on Punjabi migration and starts with his own family’s journey from India to Wolverhampton. CHANDIGARH, PUNJAB - Anand presents the research on Punjabi migration to Punjabi’s and the event is televised across Punjab and internationally via Sikh and Punjabi channels. CHANDIGARH PUNJAB - A very engaging audience asks very interesting and intelligent questions on migration, collecting images in the digital age, religious and ethnic identities and representation. CHANDIGARH PUNJAB - Anand Chhabra interviewed by journalist PARUL and televised around India and international and friends have reported seeing this in their homes in Wolverhampton! 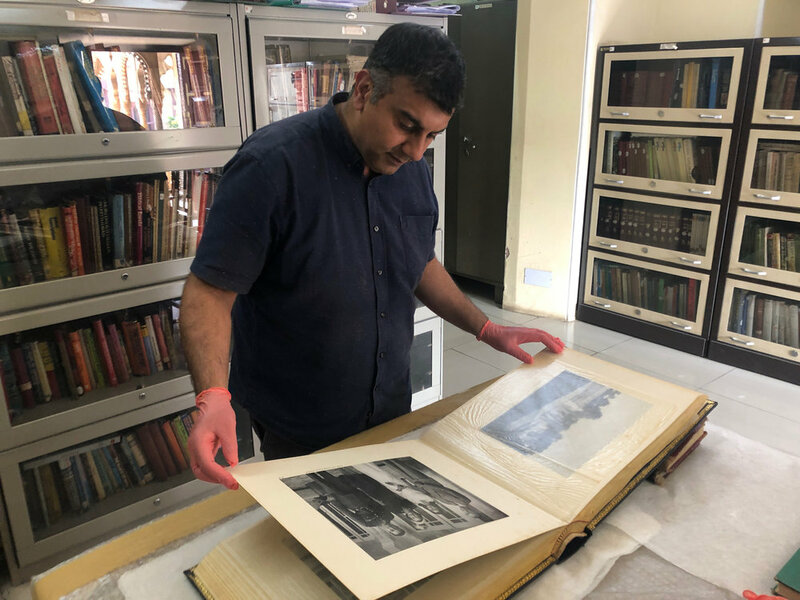 PUNJAB, INDIA - News about the archive reached the media and was represented across various media in India c/o Diwan Manna (president of the Punjab Lalit Kala Akademi. This was a full page in the broadsheet Indian Express after interview with Anand Chhabra in India and the filmed interview by Parul has been broadcast by Punjabi channels internationally including the UK! JAIPUR- In Jaipur Anand received an invited to research the Maharaja Sawai Man Singh II Museum archive by director Yunus Kahmani and was wonderfully surprised to be able see the world class gallery which houses the collection curated by Giles Tillotson. JAIPUR - Anand Chhabra viewing a wedding family album (with nice pink gloves!) of the Maharaja and also with figures such a Lord Mountbatten and Maharani Gayatri Devi including in the albums. JAIPUR - Amazing collection of double exposures from the Maharaja Sawai Man Singh’s collection. The charming ladies pictured here is one of the many of his concubine’s. JAIPUR - Now encased in vitrine cases at the Museum and Gallery the albums kept hidden away are available for many to see just like the Apna heritage Archive! PUSHKAR- Lukas Birk picture here with a photograph from the Apna Heritage Archive. Working very ethically in South East Asia helping communities with photography projects and archive exhibitions. Very inspiriting time talking with his young man. PUSHKAR - A web page from Lukas Birk’s website about his box camera project in Afghanistan. Box camera’s were made by hand before becoming a source of income for photographers. 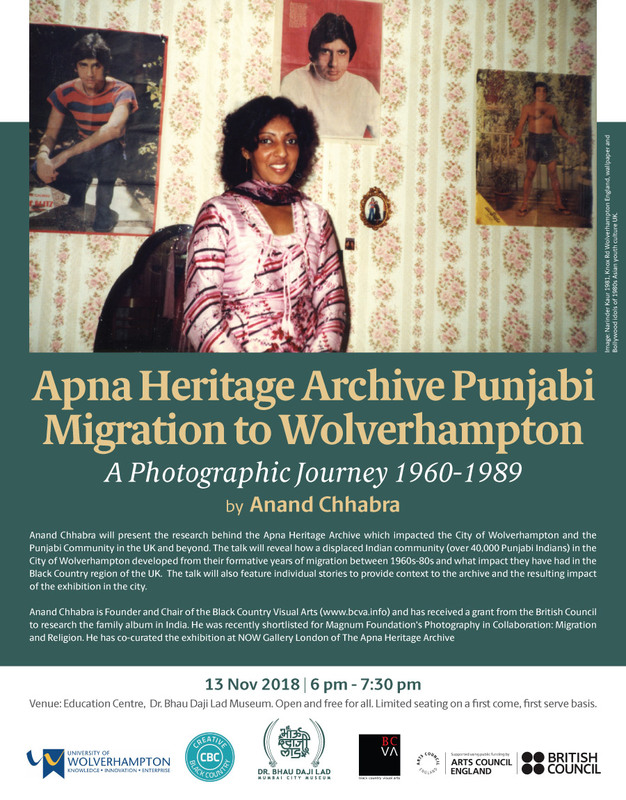 MUMBAI - Marketing poster for the presentation of Punjabi migration to Wolverhampton c1960-80s to be presented at the Dr Bhau Daji Lad Museum in Mumba, Mumbai’s greatest and oldest museum (formerly the Victoria and Albert Museum). Mumbai also formerly known as Bombay is a hotspot for arts and culture in India and the home of the Bollywood Industry. 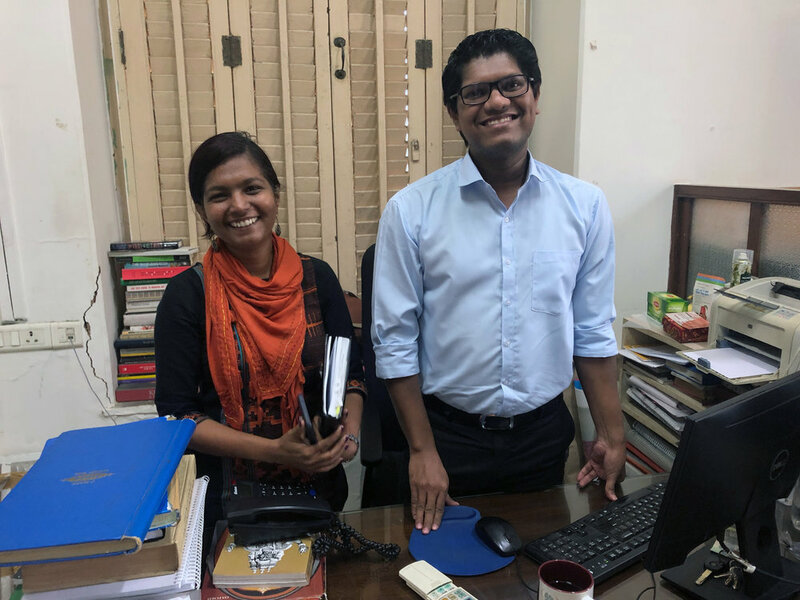 MUMBAI - Ruta Wahgmare and Himanshu Kadam were the super bright curators at the Dr. Bhau Daji Lad Museum I took a quick snap while they were together. Wonderful to meet Indian curators something of a rarity in the UK. Very thankful to them to invite me as a speaker, as well as the welcome and the hospitality I received from them. MUMBAI- Interior of the Dr Bhau Daji Lad (formerly the Victoria and Albert Museum) where a great and engaging audience came to hear Anand talk about about the displaced community of Punjabi’s journey to Wolverhampton. The Dr Bhau Daji Lad museum in Mumbai won a World UNESCO award for heritage and conservation for restoration of the building. Literally no stone was left unturned in ensuring that the building was restored to its former glory. Very honoured to have presented here. MUMBAI - Great to have such an engaging crowd stop over to receive hospitality ask questions and browse the physical collection of images from the Apna Heritage Archive. MUMBAI - The indomitable Anusha Yada pictured here as I spent an amazing time with her and her ‘Indian Memory Project’, she has an amazing collection that really brings out the stories in the photos. She inspired Anand’s own collection and gave some amazing thoughts about what else it could be going forward! Mumbai - Hamilton Studios in Bombay one of the oldest and well established photographic studios in Mumbai founded in 1928 by Sir Victor Sassoon, Anand due to a very tight schedule in India just decided to turn up and fortunately it was open! Mumbai - Another indomitable lady Ajita Madhavji whose father photographed notable people of India from Maharajas to Generals and Politicians like Ambedkar. Anand was very fortunate to meet with her as she was not entirely well and yet she spoke of her journey with her fathers studio as accidental yet destined to love and embrace it. Pictured here with her chosen image of the Golden Temple, Amritsar from the Apna Heritage Archive. 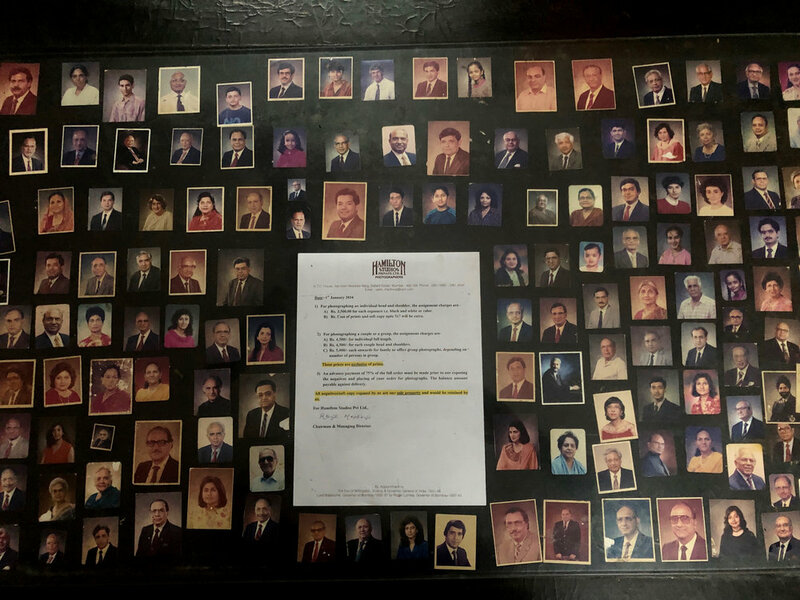 Mumbai - ‘Head Shots’ taken over the years at the Hamilton Studios and presented at the welcome desk. There as many as 900,000 negatives stored and waiting to be archived by the studio! Apna Heritage Archive had 2000 images but its a good start…..ok not as good but better than no images! BANGALORE - …….the lightbox appeared and even though they had a few negatives I was excited to see what they revealed…..
BANGALORE - the images reveal the faces of men, women and children…..fantastic images……. but having no narrative to go with them I was very saddened that the information on who, where, when and why was missing. BANGALORE - Suresh (right) from Shanti Rd arts centre helps gather a few artists at the centre to help conduct a workshop. BANGALORE - Meeting with partners Tasveer Arts at their very plush offices in India. Amazing and eclectic collection of art and photography with regular sales across to collectors and galleries around the world pictured here original works from Dayanita Singh, Marc Riboud and Andy Warhol to name just a few! BANGALORE - The wonderful Sunando Chakraborty Anand’s contact for this partnership visit with Tasveer Arts who enabled the visit to India. Sunando was very enthusiastically and knowledgeably showing me the various book productions for photographers that they were undertaking at their offices in Bangalore. BANGALORE - My initial visit was try and engage with partners in the visit the British Council which I did in the cities I visited had found them very welcoming and engaging an fascinated by the projected. They also supported and visited at the speaking engagements that Anand undertook in India.